Join the Art Walk opening night festivities at nancy O on Friday, August 24 from 5:00 -8:00 pm! nancy O will again host local artist and Master Sculptor David Boyajian, who will be exhibiting his work “Orange Squeeze” on the lawn at 23 Catoonah Street. The bright orange sculpture is one of two pieces that David will be exhibiting in Ridgefield, with his other work on display in front of Town Hall. In addition, nancy O is thrilled to host Lisa Kuller of Zenweave at Cider Mill Studio. Lisa will demonstrate both spinning and weaving, with looms available to try weaving. Her handspun yarn, decorative weavings and small looms (which come with coupon for a lesson) will be available for purchase. In addition to opening night, Lisa will be at nancy O from 10:00 am – 2:00 pm on Saturday 8/25. Zenweave handspun yarn and woven goods are created by Lisa. 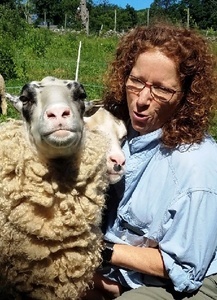 Most come from local sheep and alpaca fiber which she has taken from the sheared fleece to finished product. Instruction on weaving and spinning is available through Zenweave at Cider Mill Studio, located on Topstone Road in Ridgefield. Knitting classes for all levels are offered at nancy O. Registration for Fall knitting classes will be open on 8/25. On Friday, 8/24, nancy O will be open until 8:00, featuring special offers and discounts, as well as complimentary refreshments and a knitting social. All are welcome to join!